The Emerald Tree Boa is a non-venomous boa species that is considered to be one of the most beautiful snakes in the world. 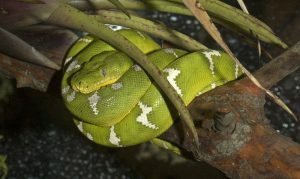 They are known for their cryptic emerald coloration from which they get their name, and are often confused for the green tree python. These snakes are scattered across the northern rainforests of the continent of South America and are also known as the Green Tree Boa, or simply, the Emerald Boa. This species is not dangerous to humans and is quite popular in the pet trade. Size: They can reach the maximum length of approximately 2 meters (6.6 feet or 79 inches). Weight: Adult males can weigh up to 1.1 kg, while the females can be up to 1.5. Head: The head is relatively larger by ratio and is somewhat flat with two distinct nostrils just above the mouth. Body: The laterally flat body has a somewhat triangular shape ending in a prehensile tail. Skin Color: The dorsal (upward/back) region of the skin is bright green having white triangular-patch (‘lightning bolt’) patterns regularly distributed down to the tail. The ventral (downward/belly) part is whitish to bright yellowish. Eyes: The pupils are vertical like that of cats. Teeth/Dentition: The mouth holds a pair of long and sharp frontal teeth pointed sharply backward. 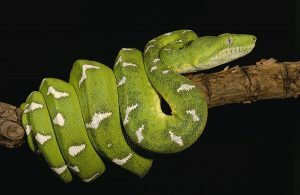 Sexual Dimorphism/Differences: Female emerald tree boas are usually larger by size; however, the males have larger spurs. The life expectancy of this snake is approximately 20 years in captivity (as a pet or in the zoo). However, they usually live for around 15 years in the wild. 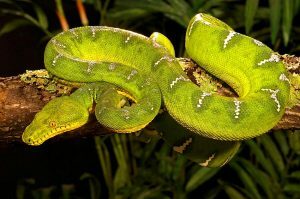 Emerald Tree Boas are found in the Amazon Basin of Brazil, Columbia, Venezuela, Surinam, Ecuador, French Guinea, Guyana, Peru, and Bolivia. 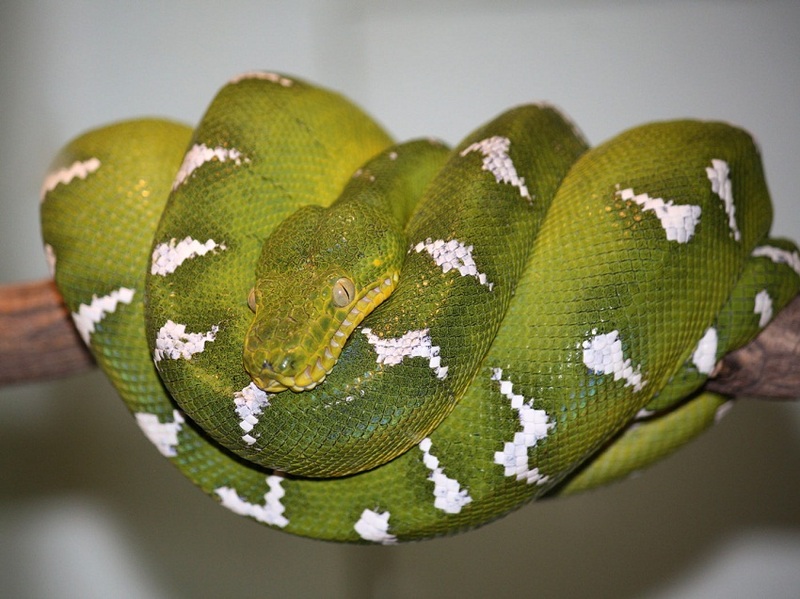 No regional subspecies of the Emerald Tree Boa is currently recognized by the biologists. The terrestrial biomes of these serpents are the primary and secondary vegetation of the tropical rainforests, up to 1000 m above sea level. They are also found in the swamps, close to the rivers, though they are not dependent on water. Unlike the squarish nose of the ETB, the GTP’s nose is more rounded, having softer edges. The body scales of the boa are much larger than that of the python. While the ETB has two rows of heat pits above the mouth, the GTP has only one. 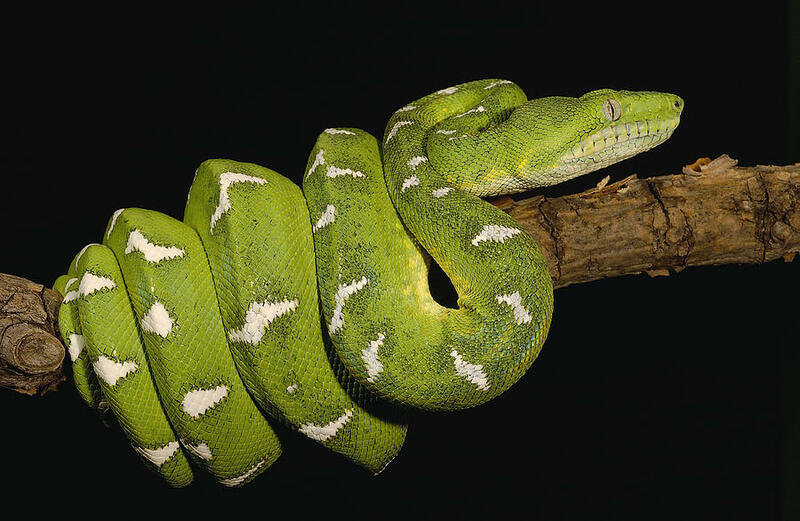 The Emerald Tree Boa is primarily solitary by nature and would interact only during the season of mating. However, male to male aggressive behavior has been studied in these snakes, especially if they happen to come close to each other. 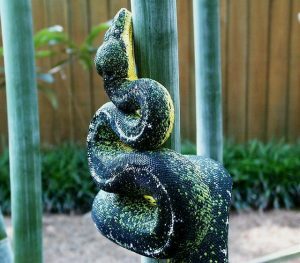 The ETB is nocturnal, and tend to spend most of its time on treetops, seldom coming down to the ground level, except for basking in the sun. They are ambush predators, that is, they conceal themselves and wait for their prey. They hang themselves from the branches with the mouth close to the ground, as they attack the unsuspecting rodents that pass by. The snake kills its prey using constriction by holding the victim with its jowls, and then quickly encircling itself around the animal’s body and continually squeezing it with the pressure of its body muscles. This makes the prey immobile, and it gradually faints and dies from suffocation. Because their rate of metabolism is extremely slow, they consume much less food compared to the other ground-dwelling snake species. In fact, their meals can be several months apart. 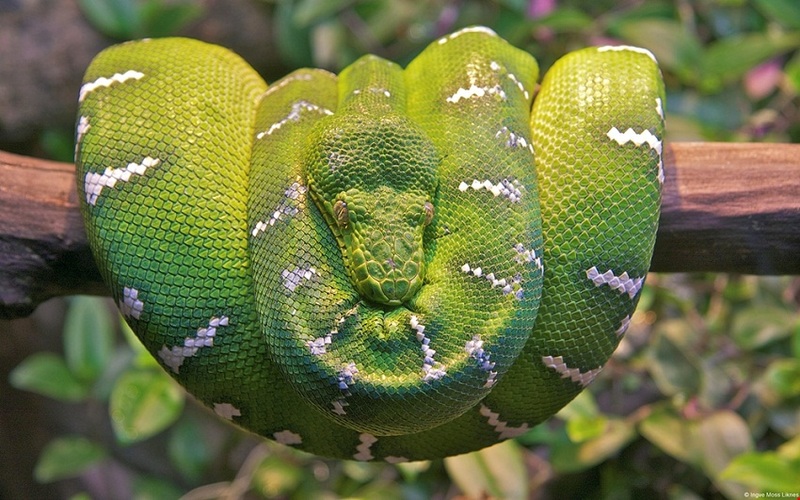 These boas can move very quickly from one tree to another through the foliage. When they rest, they firmly keep themselves clung to the branches of trees using their tail, while the rest of the body is kept wrapped around the tree branch with the head hidden at the center of the coil. Very little is known about the mating behavior of this species, and a few studies could only be conducted in the zoo. The breeding season of this snake falls between April and July. The females reproduce only once in every two years and do not lay eggs. They are ovoviviparous, with the gestation period being 6-7 months. The female snake carries the fertilized eggs inside the body, as the offspring grow up within their shells deriving nourishment from the egg yolk. When the young ones develop completely, they hatch out inside the body of the female, while the mother gives birth to 3 to 18 (average 10) live young. The baby emerald tree boas have an average length of 30 cm (12 inches), with each juvenile having a weight of about 20 to 50 g.
After their birth, they can have different body colors like bright red, brick-red, yellow or orange. 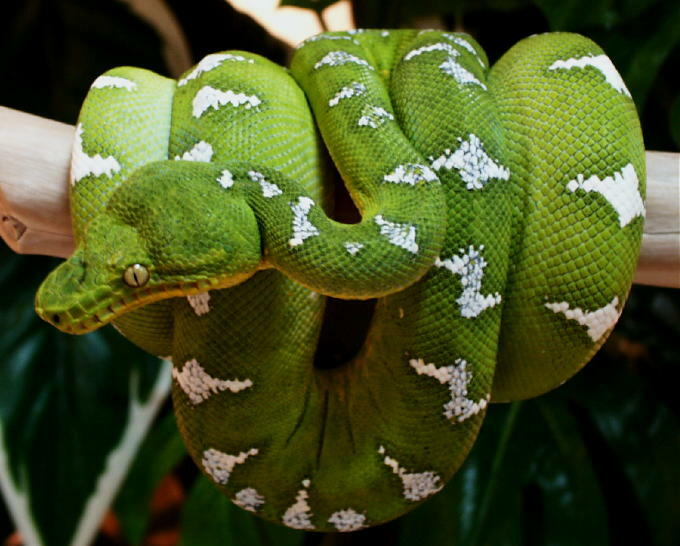 They take around a year to get their characteristic green coloration. The babies are able to hunt for their food right after they are born, and they usually feast upon amphibians and small reptiles. The age of sexual maturity of the males is 3-4 years, while for the females, it is 4-5. Their bright green coloration and the paradoxical patterns help them stay camouflaged among the greens of the forest. Since their vision is weak, they have pits around their mouth to compensate for this discrepancy. The snake uses these pits to spot its prey’s movement by using the body heat that the latter releases. Though this feature is common with many other boa species, the number of these infrared radiation sensors present in the emerald boa is more in numbers, compared to the other boa species. The tail of this tree-dwelling snake is quite prehensile, giving them the ability to have a better grip on the branch they cling to. 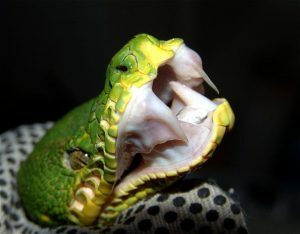 The snake can also use its tongue sensors to detect vibrations, which in turn help it spot prey or protect itself from predators. The color variation in the hatchlings is thought to be a mimicry of the venomous viper species that share a common habitat. This is a defense mechanism to confuse/ward off their enemies. The primary food of these reptiles includes rats, bats, possums, lizards, and similar other rodents, small mammals, and marsupials. Some scientists and researchers also believe that they prey upon some birds as well. However, analyses of the stomach content of several specimens did not support this fact. In the wild, the emerald tree boas are usually targeted by the birds of prey. Large species of birds, primarily the Guinean crested eagles, are their foremost enemies. The Emerald Tree Boa is not a threatened or endangered species since their population is considerably static in the wild. 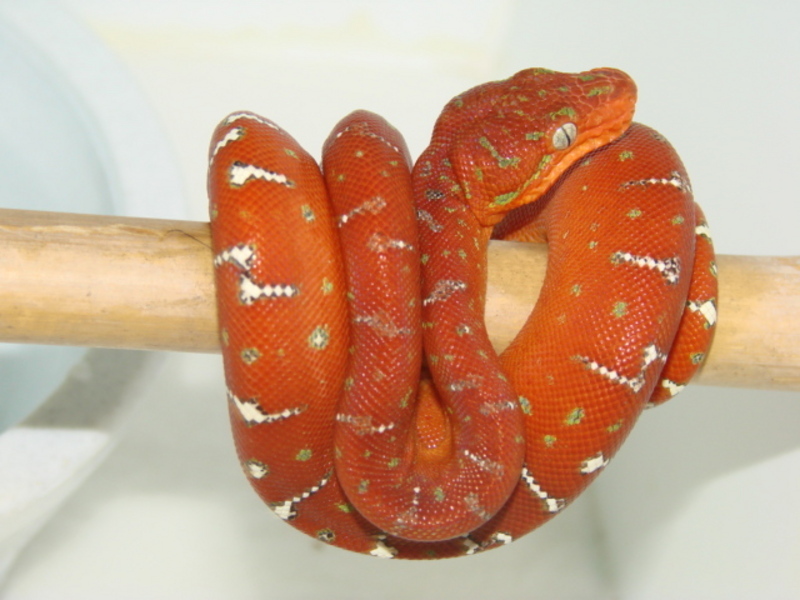 The IUCN 3.1 has categorized these boas under the ‘LC’ (Least Concern) species list. The snake plays an important ecological role by preying primarily on small marsupials and rodents, thus keeping their population under control. The part caninus in their scientific name comes from the dog-like appearance of their face.